Kinart took over as Capital's brewmaster October 27. But Kinart, who at only 30 years old was recently named brewmaster at one of the most lauded craft beer companies in the country, might be using her tall rubber brewing boots to stomp on a variety of barriers in an industry historically dominated by men, whether she means to or not. Clad in flannel, with a glint visible in her eyes even through thick-rimmed glasses, she says she loves many things. The tranquility that comes with yoga. The companionship of her two dogs. And the sights, smells and sounds of a bustling brew house. Kinart’s beer education started humbly. Working as a bartender, she wanted to know more about the craft libations she served to customers. She eventually decided the best way to understand beer was to make her own, so she set up a small brewing operation at home. 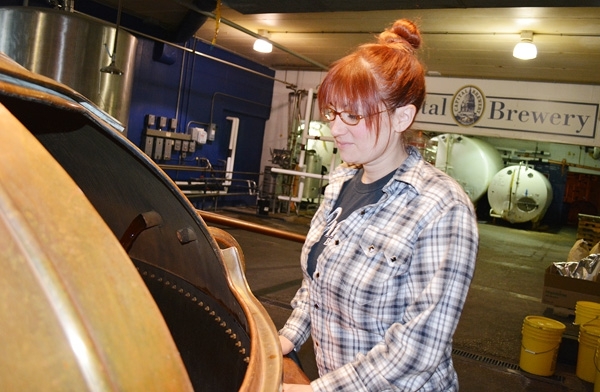 With a bachelor’s degree in biology, she figured the chemistry of ales and lagers would dovetail nicely with some of her prior education. Then the kettle began spewing sloppy, hoppy water all over the stovetop. At the glorious but somewhat notorious crossroads of science, art and blue-collar labor, Kinart found satisfaction and success. Lugging sacks of grain. Sweating and scrubbing tanks. Getting scalded by boiling mash. These brew houses where Kinart learned were typically the domains of men. But she joined in to work, and to learn, and found herself adept at both. The fact that she saw few women around her only added to brewing’s allure. So she did, eventually getting hired as an assistant brewer at Capital Brewery in Middleton. While she helped make an array of beer styles, it was earlier this year when she was first able to spearhead her own recipe from start to finish. The result, a rich black Schwarzbier called “Fishin’ in the Dark,” was an unmitigated success. While director of operations Brian Destree announced Kinart's promotion to brewmaster last week, Kinart said being the master doesn't mean she won’t still be a student. It will mean other things, too, but if all the peripherals that surround the title "brewmaster" ever overwhelm her, she can always stride back into the brew house. It’s a place she has always felt right at home, even if her mere presence is breaking barriers.